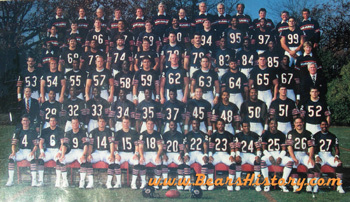 1987 Bears team photo. Rookie first-round pick Jim Harbaugh wore the number 14, as QB Steve Fuller still owned 4. The 1987 season proved to be a frustrating one for not only the Bears, but probably for most associated with professional football. The league endured it second strike-shortened season in the last six, and this was a strike that truly divided teams, including Chicago. In the windy city, the strike divided its players and tarnished its coach, and the season would be the last for greats such as Walter Payton, Gary Fencik, Willie Gault, Wilber Marshall, and for all intents and purposes, Otis Wilson. 1987 started with the usual drama in Platteville-everyone wondering if Jim McMahon would play at all during the year, McMahon openly fueding with coach Mike Ditka, upset over the new signal-caller Jim Harbaugh that the team picked on the first round. Tension was also building due to strike talk that loomed-always a bad omen for a team. First up for Chicago in 1987 was a matchup with the defending world champion New York Giants. As if this game wasn't tough enough in and of itself, it would be played on Monday Night Football, and the Bears would be led by 3rd-year QB Mike Tomczak. McMahon and Fuller were injured, Doug Flutie was traded, and rookie Jim Harbaugh needed to be groomed for a few years before he would be ready. The Bears pulled it out in their typical fashion, however, trouncing the world champs by a score of 34-19 behind a remarkable performance by Tomczak. The Bears, it appeared, were back. The club won their second game against Tampa on September 20th, then the strike of '87 was called, forcing the cancellation of all NFL games the week of the 27th. During the first days of the strike, the league pondered what to do, as most teams' players were deeply divided over whether to strike or not. This was not 1982, everyone learned, as the league decided to hire replacement players (referred to as "scabs" and "spare Bears"). Cancelling half the season was not an option. Mike Ditka decided to make his feelings public about the strike, as he fully backed management on the work-stoppage. He referred to the spare players as his "real" players, a move which angered the true Bears out on strike. This turned out to be a wound that would not heal easily or quickly in the months to come. The strike turned out to only last for four weeks, encompassing three games, and the Bears went 2-1. The teams that hired the best replacement players did themselves a favor in the end, a group of which the Bears were a part of. When the "real" 1987 resumed, Jim McMahon was back at QB, and the Bears pulled off their biggest come-from-behind win in history, beating Tampa 27-26 after trailing 20-0. Inspiring the victory was. They then won the next two games, including a 26-24 victory over the Packers at Lambeau Field. In this game, Chicago trailed with less than a minute left, when McMahon led the team down the field for a game-winning 55 yard field goal off the leg of Kevin Butler. After the kick, Butler turned and "flipped the bird" to Packer coach Forrest Gregg, in effect saying "see you later" to the coach who was finally axed after the '87 season. After the inspiring Green Bay win, Chicago lost a close game at Denver, 31-29, then beat Green Bay at home and Minnesota on the road, in the famous "Rollerdome" game (Mike Ditka referred to the Metrodome by this name, prompting the Vikings' cheerleaders to parade around on skates throughout the contest.) The Bears were 10-2 with three games left, but dropped 2 of them, and struggled into the playoffs. One of the losses was a 41-0 disaster at San Francisco, and Mike Ditka threw his gum at a heckling fan, prompting assault charges to be filed against him. This was certainly not a good way to enter the playoffs. The rematch against the Redskins was held at Soldier Field on January 10. Jim McMahon was the undisputed starter, but he could work no magic. Chicago lost 21-17, and fans again wondered where the magic of 1985 went. The Bears had the ball in the waning minutes, but retiring superstar Walter Payton missed a first down by inches that would have kept the winning drive alive. Payton was dejected for his career to go out on this note, but everyone knew they would see him again shortly in Canton, OH. Two in a row to Skins. Passing: Jim McMahon- McMahon began the '87 season on injured reserve, and the strike helped him recover from his rotator cuff injury. He passed for 1,639 yards, 12 touchdowns and an 87.4 rating. Rushing: Neal Anderson- Became the first Bear other than Walter Payton to lead the team in rushing since 1974. Started at fullback next to Payton and finished with 586 yards rushing and 3 touchdowns. Also led the Bears in receptions with 47. Receiving Yards: Willie Gault- Final season as a Bear; caught 35 passes for 705 yards and 7 touchdowns. His speed made many other things possible in the Bear offense. Scoring: Kevin Butler- Butler scored 85 points on 19 field goals and 28 PAT's. Sacks: Richard Dent- Fourth straight season leading the team, this year with 13.5 sacks. Interceptions: Dave Duerson- Duerson intercepted three passes in his fifth pro season. He also defended five passes and recorded two sacks. Jim McMahon started six games at quarterback, Mike Tomczak six in 1987's 12 union games. Walter Payton played his final season as the starting halfback, while Neal Anderson took over for Matt Suhey at fullback. Willie Gault and rookie Ron Morris started all games at receiver. The offensive line, tight end and kicker spots were held by the same men that manned them since 1985. On defense, the only change was second-year man Vestee Jackson replacing the departed Reggie Phillips at the starting corner spot across from Mike Richardson. Bryan Wagner replaced Maury Buford as the punter. Offense, left to right: Jim McMahon, Walter Payton, Neal Anderson, Willie Gault, Ron Morris, Jim Covert, Mark Bortz, Jay Hilgenberg, Tom Thayer, Keith Van Horne, Emery Moorehead, Kevin Butler. Defense, left to right: Richard Dent, Steve McMichael, William Perry, Dan Hampton, Wilber Marshall, Mike Singletary, Otis Wilson, Mike Richardson, Dave Duerson, Gary Fencik, Vestee Jackson, Bryan Wagner. Click here to see this page with the 1987 replacement player roster instead of the "union" player roster. Mike Ditka would remain as Head Coach of the Chicago Bears for five more seasons past 1987, but the proverbial first nail in his coffin probably was driven in January of that year. Ditka's best friend and biggest ally in the Bears' front office was General Manager Jerry Vainisi, a Bears employee since the early 1970's and the final executive hand-picked by founder George Halas. Since assuming the reins of the team from Jim Finks in 1983, Vainisi served as an important buffer for Ditka with the McCaskey family. According to Vainisi as published in Armen Keteyian's book Ditka: Monster of the Midway, in late 1986 Michael McCaskey began "trying to fabricate a scenario to show breach of contract" [on Vainisi's part]. According to the book, McCaskey accused Vainisi of lying to him regarding a fan club deal with NFL Properties, a deal on which McCaskey wanted to negotiate for more money for the Bears. After making the accusation directed toward Vainisi at an open meeting, he told the General Manager "I can't trust you, and you're fired." According to the book, McCaskey was tired of internal debates, most often pitting the President (McCaskey) and personnel boss Bill Tobin versus Ditka and Vainisi. According to Vainisi, McCaskey constantly harped for "more revenue, more revenue, more revenue, and wore his high-minded Harvard ways on the sleeve of his preppy blue blazers." (McCaskey actually attended Yale but taught business at Harvard). Upon hearing of the firing, Ditka met with McCaskey and made a proposal. If McCaskey would keep Vainisi for one more year, at which point Ditka's contract would run out, the two would leave together. McCaskey declined to accept the offer. In personnel meetings for the 1987 draft, it would soon become obvious how the balance of power had swung away from Ditka. In the 1987 draft, head coach Mike Ditka felt he had four quarterbacks capable of getting the Bears back to the Super Bowl: Jim McMahon, Mike Tomczak, Doug Flutie or Steve Fuller. (Fuller and Flutie would be released during the season). However, without his buddy Jerry Vainisi there to back him in the draft room, Ditka lost out in his bid to draft Cincinnati LB/DE Alex Gordon. Chicago instead selected Michigan quarterback Jim Harbaugh. The Bears opened the 1987 season against 1986's Super Bowl Champions, the New York Giants, at Soldier Field. Mike Tomczak, subbing for the injured Jim McMahon, had a monster game, completing 20 of 34 passes for 292 yards. The Bears blew out the champs 34-19 on Monday Night Football. Perhaps most memorable about the game was Dennis McKinnon's 94-yard punt return for a touchdown. McKinnon seemed to juke defenders at full speed, then almost fell down before taking it all the way. It was the longest punt return in the NFL in 1987 and to that point the longest in Bears history. Following week two, NFL players went on strike for the second time since 1982. Unlike during the '82 season, the owners did not give up quietly. The first week's games were cancelled, but quickly all 28 NFL teams collected "replacement" rosters, and these teams played for three weeks to largely empty stadiums. The strike would last 24 days before union players started crossing the picket lines to play. Bears union players protested outside Soldier Field and practiced on their own during the strike. Head Coach Mike Ditka angrily criticized the union players his "real" team, further alienating the union players when they returned. Ditka also allowed the regulars to vote after they returned to decide if the replacement players would be allowed to join the regulars following the end of the strike. Players voted 44-1 to disallow the "scabs" to join the team, but Ditka overruled them and allowed some notables such as John Wojciechowski, Mark Rodenhauser, Lorenzo Lynch and Glen Kozlowski to stay with the team. Other notable Bear replacements included quarterbacks Mike Hohensee and Sean Payton. Hohensee is currently the head coach of the Chicago Rush arena team, while Payton has enjoyed a long NFL coaching career. In 2006, he became head coach of the New Orleans Saints. Following the strike, the Bears regulars, led by a rejuvenated Jim McMahon, pulled off three straight come-from-behind wins against Tampa, Kansas City and Green Bay. The following week against Denver they rallied again but couldn't pull off the win. The loss to Denver was the first game Jim McMahon started without a win in 25 games, dating back to 1984. Chicago finished the strike-shortened season 11-4, but were defeated by the Washington Redskins in the playoffs at Soldier Field for the second season in a row. The Bears led 14-0 at one point, but their backs were broken on a Darrell Green punt return for a touchdown. Walter Payton had the ball on Chicago's final offensive play on fourth down, but was forced out of bounds several yards short of a first down. Tampa trades quarterback Steve Young to the San Francisco 49ers for second and fifth round picks so it can select Vinny Testaverde from Miami. While Young could be had for a bargain, the Bears draft QB Jim Harbaugh from Michigan, a running team, with their 27th pick in the first round. The NFL is hit by a players strike once again, for the second time in five years. This time the NFL is prepared, and each team fields "scab" teams with replacement players. Thus the outcome of many team's seasons was dependent on how their replacement players played. Surprising teams this season were New Orleans, Minnesota and Indianapolis. Washington again beats Chicago in the NFC Divisional round, while Minnesota shocks the 13-2 49ers in San Francisco. The Vikings lost in the NFC Championship to Washington, who dealt Denver their second consecutive Super Bowl loss, 42-10. DL Mike Hartenstine, cut, signed with Minnesota Vikings.